Curious Fox recently turned 1 and to celebrate they had an awesome party. Unfortunately I couldn’t make it but they sent me their catalogue so I could see what books they had coming out at the beginning of 2014 and I just had to share some of them with you! The first book in the catalogue really jumped out at me and I really, really wanted a copy. 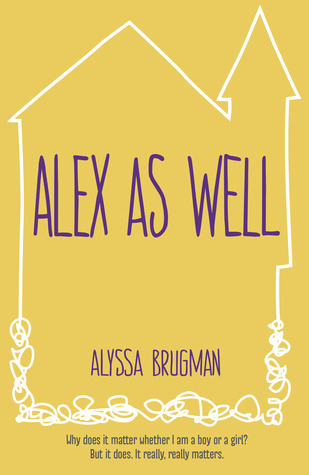 The title is Alex As Well, it is by Australian author Alyssa Brugman and it will hit the shelves in May 2014. Alex As Well is the story of Alex, who was born as ‘sexually ambiguous’ – there were both male and female reproductive organs present. The doctors offered medical treatment to regulate the hormones in Alex’s body and his parents raised him as a boy. I believe it starts when Alex is 14 and has made an announcement; ‘I’m a girl.’ Alex is now changing everything, her school, her life, her friends – her whole identity. And her parents don’t know how to react. Doesn’t it sound incredible? I really think awareness that this kind of thing happens in peoples lives needs to be brought about for teens – and people in general – more and if written well this book might just be perfect in my eyes. I really can’t wait to get my hands on it and I am really happy Curious Fox picked it as one of their titles as some publishers may have shied away from it! Next up on my list of books I really want to read from this publisher this year is The Ruby Starship by Sharon Gosling. This is the sequel to The Diamond Thief, which if you are familiar with my blog you may know I adored! Its middle grade adventure set in Victorian London, you couldn’t get more up my street! The Ruby Airship picks up where the Diamond Thief left off I believe and Remy has choices to make and consequences to live with. I really loved her character so I am looking forward to being reunited with her. The Ruby Airship will be published in April. Another middle grade book coming from CF which I love the sound of is The Serpent House by Be a Davenport. Its a time travelling book set in Victorian times for the majority but going between then and the 11th century. The main character is Annie, a servant girl, who’s employer, Lady Hexer of Hexer Hall orders to go back in time and steal a book. The book was owned by a doctor who performed dark magic on his leper patients and is kept safe by fearsome serpents which terrify Annie. Magic, time travel, victorian and medieval settings, something sinter going one… I need this book in my life. Unfortunately its not out until June though so I think I might have to wait! Other YA/MG books coming out from the publisher include two books about a group of circus kids who try and solve crimes which their leader Lizzie Brown predicts will happen called The Magnificent Lizzie Brown and the Mysterious Phantom and The Magnificent Lizzie Brown and the Devil’s Hound by Vicki Lockwood, coming in March and May. Then we have books one and two of Erin Johnson’s Wanted series; Grace and the Guiltless and Grace Alone, published in February and May. Also I’ve been hearing great things about the young adult book Half My Facebook Friends are Ferrets by J A Buckle which was published in January. The publishing house are also venturing into character books with a 3 in 1 Batman and a 3 in 1 Superman book both coming in June 2014 and a DC Super-Pets illustrated encyclopaedia which has profiles, stats and history about the pets and their superhero owners also coming in June. The picture books look fun and make me want kids to read to with a whole Nursery Rhyme board book series by illustrator Charles Reasoner coming out in March – complete with Hey Diddle Diddle, Hickory Dickory Dock, Jack and Jill and Little Bo Peep in the series. Then there’s Flood by Alvaro F Villa, a picture book about the effects of flooding on a family’s home and the hope that comes with leaving ones home when flood warnings are issued. Then finally a picture book filled with stills and lines from the movie The Wizard of Oz. I think this years catalogue really does sound great and theres pretty much something for everyone! For such a young publisher Curious Fox has a great list of titles and I’ve even found some of their previous titles that I really want to go back to from reading the catalogue! Ooh, Alex As Well sounds very good. I think I’ve only read one or two books with intersex characters so I’ll definitely be looking out for it. Hi Raimy, this is Ann from Curious Fox. We’re so glad you’re looking forward to the titles we’re publishing this year. Would you like a review copy of Alex As Well?